City Lights Books, 9780872867055, 168pp. 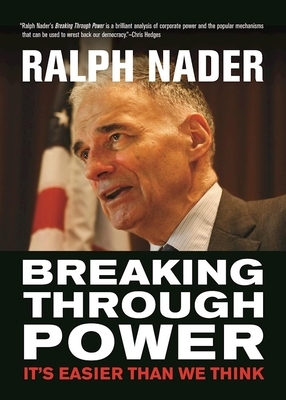 In Breaking Through Power, Ralph Nader draws from a lifetime waging--and often winning--David vs. Goliath battles against big corporations and the United States government. In this succinct, Tom Paine-style wake-up call, the iconic consumer advocate highlights the success stories of fellow Americans who organize change and work together to derail the many ways in which wealth manipulates politics, labor, media, the environment, and the quality of national life today. Nader makes an inspired case about how the nation can--and must--be democratically managed by communities guided by the United States Constitution, not by the dictates of big businesses and the wealthy few. This is classic Ralph Nader, a crystallization of the core political beliefs and commitments that have driven his lifetime of advocacy for greater democracy. About Ralph Nader: Named by The Atlantic as one of the hundred most influential figures in American history, and by Time and Life magazines as one of the most influential Americans of the twentieth century, Ralph Nader has helped us drive safer cars, eat healthier food, breathe better air, drink cleaner water, and work in safer environments for more than four decades. Nader's recent books include Animal Envy, Unstoppable, The Good Fight, and the bestseller, Seventeen Traditions. Nader writes a syndicated column, has his own radio show, and gives lectures and interviews year round. Named by The Atlantic as one of the hundred most influential figures in American history, and by Time and Life magazines as one of the most influential Americans of the twentieth century, Ralph Nader has helped us drive safer cars, eat healthier food, breathe better air, drink cleaner water, and work in safer environments for more than four decades. The iconic champion of consumer rights first made headlines in 1965 with his pioneering bestseller Unsafe at Any Speed, a devastating indictment that lambasted the auto industry for producing unsafe vehicles. The book led to congressional hearings and automobile safety laws passed in 1966, including the National Traffic and Motor Vehicle Safety Act. Nader was instrumental in the creation of the Occupational Safety and Health Administration (OSHA), the Environmental Protection Agency (EPA), the Consumer Product Safety Commission (CSPC), and the National Highway Transportation Safety Administration (NHTSA). Many lives have been saved by Nader's involvement in the recall of millions of unsafe consumer products, including defective motor vehicles, and in the protection of laborers and the environment. By starting dozens of citizen groups, Ralph Nader has created an atmosphere of corporate and governmental accountability. Nader's recent books include Animal Envy, Unstoppable, The Good Fight, and the bestseller, Seventeen Traditions. Nader writes a syndicated column, has his own radio show, and gives lectures and interviews year round.